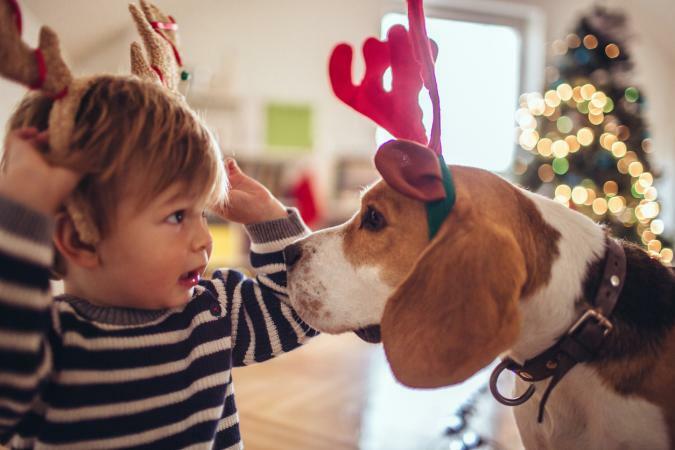 When you think about Christmas with your dog, your thoughts may center on which items to put in his holiday stocking this year, however, preparing for the holidays with a pet in the home involves much more than gift giving. For many of us, decorating our home is the first step in preparing for the holidays and many of the items we use are not typically found around the house all year long. Being naturally curious creatures, dogs will want to check out anything new that comes into the house and here is where some potential problems can come into play. 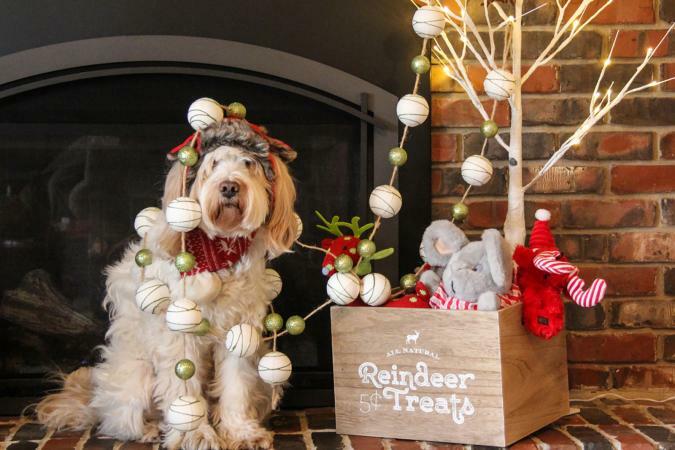 Celebrating the holidays with your dog is bound to involve setting up the traditional Christmas tree. Of course, there's nothing like the look and smell of a fresh, live Christmas tree, but how will it affect your dog? Live trees often carry unseen molds that can cause allergic reactions and/or respiratory distress in some pets and people. If this the first Christmas you and your dog will be spending together, you might want to try a little test before setting up the entire tree. Bring a sample of your chosen evergreen into your home for a few days, allowing your dog to sniff it under your supervision. If you don't observe any negative reactions, it's probably safe to put up a live tree. However, if your dog does show an adverse reaction, remove the branch immediately; wash your pet's face to remove lingering traces of the allergen and plan on enjoying an artificial tree this year. Choosing just the right placement for your tree also makes a difference to your pet's safety. Consider purchasing a smaller tree and setting it up on a tabletop, out of your dog's reach. Full size trees are best set up in a corner where your pet's access can be limited. If possible, wire the top of the tree to a drapery pole or staircase banister to lessen the chances of it tipping over if your dog accidentally bumps into it. Wrap the base of the tree and stand in plastic wrap to keep you dog from being tempted to drink the water, which can be toxic as fertilizers and other chemical compounds leach from the tree. Opt for plastic or resin ornaments instead of breakable glass and resist hanging ornaments at the bottom of the tree where they'll present the most temptation to your pet. Hide those electrical light cords at the back of the tree and hide any exposed cords or strategically place pieces of furniture to keep your dog from chewing them and possibly being electrocuted. Holly, Poinsettias, and Mistletoe are all abundant during the holiday season, but sharing Christmas with your dog means keeping these beautiful plants out of Fido's reach. Each of these plants carries some level of toxicity for our pets. The intensity of the reaction depends a lot on the size of your dog and how much he might ingest. Don't risk finding out which symptoms might affect your dog, simply keep the plants out of your pet's reach on a high table or bureau. Candles play a prominent role in many holiday celebrations. Advent wreaths, Menorahs and other lights may enjoy a prominent place in many homes, but they need to be kept in places where there is no chance that a bump or a tail wag may send them toppling causing a fire risk. Food is a big part of most holiday traditions, but many of the delicacies and treats we enjoy are not suitable for our pets. Chocolate: It can be toxic to your pet. Macadamia nuts: These are another toxic item for your dog. Turkey, chicken, or duck bones: These may be tasty, but they pose a choking hazard. Onions: These can cause heart problems when eaten in volume. Raisins and grapes: These items can cause renal failure when consumed in high quantities. Alcohol: Not usually on your pet's menu, but holiday entertaining may include serving alcoholic beverages that might become available to your pet if left on a low table. The most pleasurable part of celebrating Christmas and your dog is picking out a few choice presents for your furry friend. The same items that would be appropriate any other time of the year are good at Christmas too. Watch out for small toys or pieces that could break off an item and pose a choking hazard. Be sure that any item you give your pet is size appropriate. Check the ingredients used in treats to make sure your pet isn't allergic to anything listed. While safety is of prime importance, the most important thing to remember about Christmas and your dog is to watch him for stress. Lots of hustle and bustle, changes in the home, and strangers coming and going can all take a toll on your pet. Be sure to leave some quiet time in the schedule to give both of you an opportunity to decompress.